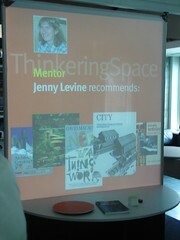 Yesterday I gave an overview of the Thinkering Spaces project, so today I want to explain a little more about how we were able to manipulate content using the various technologies and objects. RFID is a big component of the system, as it identifies content and allows it to travel with an object. To start, the TS folks put a book with an RFID chip on the reader, which triggers a process that displays the cover on the screen, along with a keyboard for typing text to associate with the title. In this case, the container is the book, and the user can draw or type to add content that will travel with it. To illustrate this, they remove the first book and put a second one on the reader. A new cover image appears, along with some information that’s already been added by a previous user. Take that book off and put the first one back on, and the content we added reappears. The whole thing is very cool, and I immediately started thinking about local history collections, schoolwork, and reader reviews. All of which is the point – your librarian mind starts hopping with possibilities. Then they showed us a library card with an RFID chip in it. This one happened to have information about me stored on it, so putting it on the reader brought up information about me, which rotated with books I recommend. Others in the Thinkering Space could see all of this about me, which would be great if I was working with a group I’m mentoring, coordinating, or collaborating with. The IIT folks understand the privacy issues involved, though, so they’re exploring different ways to handle this. Alternatives include using avatars without personally identifiable information, having the group build a persona to achieve certain skills, and using special cards for collaborative clubs rather than embedding the information in standard library cards (this would provide an opt-in system). None of this is set in stone, but it demonstrates one way in which library users might share information about themselves in the physical library. 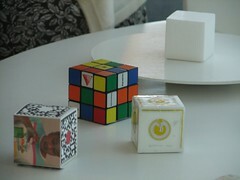 Next, we began playing with the story of The Wizard of Oz by placing a Rubik’s Cube with RFID chips on it on a reader. The starter Oz content is attached to this container and it can include the text and images from the book itself. Placing a second, blank, paper “storycube” on the reader brings up a template where someone can use a wand to drag and drop images into a template to tell a story, which can then be saved to another object (in this case, it was a small doll). Putting a second doll on the reader brought up someone else’s story. The container could be anything that uses RFID or barcodes. 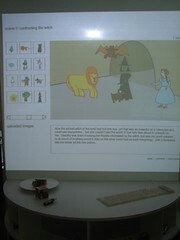 Turning the cube produces other content, such as weather maps (watch for tornadoes), and putting a camera on the reader brings up pictures and images related to the book, all of which can be manipulated on the screen. TJ then took some pictures of the group and other objects in the space, and since his digital camera had an Eye-Fi card in it, the pictures began appearing on the screen as well. We could then mash up these pictures with text, sounds, and other digital content to create a narrative, a presentation, a document, or just explore them all together. The space also has a digital microscope and a webcam that can project images onto the screen as well. We also played with a collaborative drawing table that just does a basic coloring demo right now. However, the idea is that there might be some projects where users can work on their own pieces separately to build a larger whole, or they may have to collaborate and work together as a team to create something. Sometimes they might have their head down working, but other times they might have their head up, interacting with the other participants. Pretty much everything in the space is based on collaboration, as opposed to single users. What I like about these ideas is that they expand on existing content in the library, using the library’s collection, and mashing it up with users’ ideas to create something new. It’s Jon Udell’s remixed physical library, not just the online one. Or the users create something new from the beginning, based on their interactions with our collections and services. The community can contribute content and knowledge, and the library could archive it. And it doesn’t have to be just for kids or students. For seniors who have trouble using a mouse and a computer, a setup that lets them use a wand (or even better, their fingers) to drag objects might allow them to play with digital content (especially local history) in different ways. Could families create genealogical histories this way and mash them up with community resources? The Shanachies in the Netherlands intend to build a giant screen in the DOK Library Concept Center where residents can post their own stories and pictures. Imagine combining that with library cards that let those residents update their stories and remix them in a Thinkering Space. It will be interesting to see what happens to things like narrative and copyright in these types of environments. One of the questions now is will libraries be one of them? This project gives me hope that the answer is yes, and honestly, what better institution do we have in which to discuss, explore, and implement the answers? thanks for the examples Jenny. 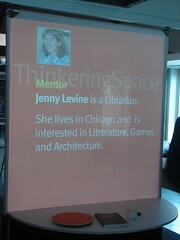 This is so exciting and reminds me of my library school experience of creating a mock up of a web page (on index cards!! in 1994. we could imagine how this would work, but had no real idea of how it would evolve. looking forward to this stage of the revolution! This is blowing me away! I can’t really put my head around it, and I guess that’s the point; this is just the beginning, no? Technology won’t solve all of our problems, but these tools are going to prove immensely useful for so many purposes. I really appreciate you posting this! awesome post! Thanks for the read.